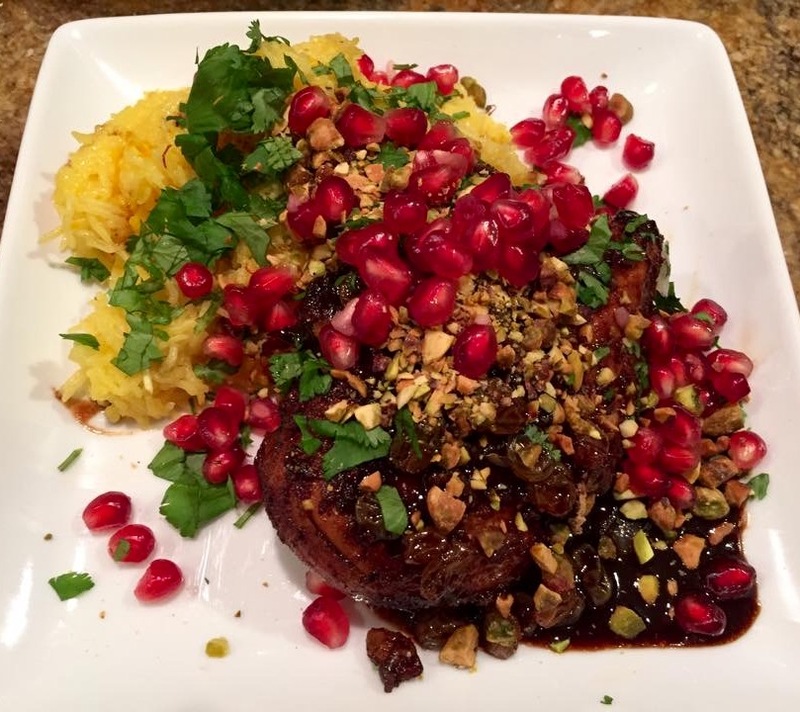 Amazing Chicken with Pomegranate and Pistachio on Persian Saffron Rice | The Sassy Spoon: Fun Food! The flavors of this dish were swimming around in my mind for a few days. Finally, I took the leap and made it. I used my pressure cooker to do the Persian Saffron Rice and it turned out fabulously. There was plenty left over for some more meals. The savory, sweet, sour and crunchy elements in this dish really sang to me. I think that they will to you. 1 pound of chicken thighs, skin removed. Sprinkle the chicken with the garlic salt and the smoked paprika. Allow to sit for at least 1 hour or up to 12 hours. Add the oil to a saute pan and brown each of the chicken pieces. Place into an oven proof dish while browning the other pieces then put into a 300 degree oven. Remove all but 3 TBS of the oil from the pan. For the sauce saute the onion and garlic in olive oil. Add the pomegranate molasses, raisins, the lemon juice, maple syrup and zest and juice of the lemon, the water, the cardamom, cinnamon and the cornstarch slurry. bring to a high simmer and whisk while the liquid thickens. Return the chicken to the pan, including juices and bring back to a full simmer. Continue to cook for about 30 minutes or until the chicken is tender. While simmering, continue to spoon the sauce over the chicken. Photographer, Chef, Writer.PR Professional. living in the Holy City of Charleston where food is King and life is sweet. With deep roots from LA, Atlanta, Chicago, San Francisco, and Hawaii. I have landed back in the Low Country with a smile and loving every bite of shrimp and grits. Reblogged this on My Manhattan Kitchen. Devany, I don’t see the ingredient list and method for the Persian Saffron Rice. Is it in another post on the blog? Devany, I don’t see the ingredient list and method for the Persian Saffron Rice. Are they posted in another entry on the blog? Thank you! This looks wonderful!!! Pingback: Persian Saffron Rice in a Rice Cooker or Pressure Cooker | The Sassy Spoon: Fun Food!